How big a dog is too big for Bloomies? Thanks, in part, to Paris Hilton, and her little dog, Tinkerbell, a new standard of pet etiquette has been set (lowered?) on the Westside, and beyond. I now encounter accessory dogs in LA retail establishments about as often as I do people using cell phones in libraries and movie theaters. Unlike the latter issue, however, this one has legs. Retailers appear willing to be wagged. Maybe I just haven't been looking in the right places, but the "no-pets" signs I recall seeing everywhere as a child are nowhere to be found today. 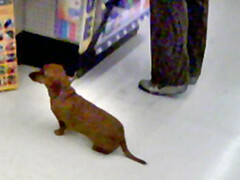 Didn't it used to be that only working dogs were welcome in stores? Wasn't there some kind of law? In California, pets are not allowed within 20 feet of where "food is stored or held for sale," said Kathy Francis, a spokeswoman for Orange County Health Care Agency. Translation: Dogs aren't allowed inside restaurants or grocery stores. Nonetheless, a dog spotted in a Westside Walgreens pharmacy this week (see inset) was made to feel so welcome that it yapped after a store employee greeted it with a hearty back scratching. Who's a good boy? Such a good boy. I love dogs as much as anyone, but, as more and more people categorize their working-class dogs as "accessories," don't we have to ask where all this is headed? Dogs being dogs, isn't it only a matter of time before their growing popularity results in more of them doing what dogs do? And, hey, how many "Code Number 2s" are going to have to be cleaned up in the shoe department before someone puts their foot down? And what about those overly eager little nippers who fuss and paw at the puny, pampered chihuahua when mommy isn't looking? Chihuahuas may not have hair, but they do have teeth, don't they? Perhaps the most important question of all is who decides how big a dog is too big for Bloomies and the like. Is a beagle too large to stroll through women's lingerie? Can a golden retriever visit the bank? Might an old English sheepdog make a good companion in a bookstore? What about six old English sheepdogs, a German shepherd and Britney's three former pets, known by the (exotic-dancer?) names Lacy, Lucky and Bit-Bit? Don't such situations have the potential to erupt into territorial disputes at, say, Borders? Might we someday see stores setting limts? "No more than two dogs at a time." Will retailers police patrons by making use of measuring bins similar to those utilized by airlines to size up carry-on luggage? "If your dog doesn't fit in this box, it must be checked." It's remarkable, the lengths to which some people will go to allow a dog to live The Simple Life. But then, that's the new reality, right? Next blog post: L.A. fire inspector: Malibu "was a tinderbox ready to go"